Tucked away on a quiet residential street in Oslo, Norway, you might mistake the International Museum of Children’s Art for any old house were it not for the sculptures. The colorful, disproportionate people and what can only be described as a cheerful melting cow stand as conspicuous sentries at the world’s premier center of child art. Founded in 1986, the International Museum of Children’s Art was the first institution of its kind. Today, it preserves and curates works by children from nearly 200 countries. Traditionally, museums are centers for “high art”—that is, trained artists who are masters of the form. Museums of folk art celebrate practitioners of the fine arts who have been on the fringes of those scenes, or even outside of them altogether. Folk art is of the people, often emerging from rural areas, indigenous societies, or ostracized communities that have been historically overlooked by elite art collectors. 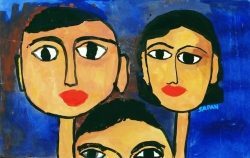 But even within the folk art world, children are a segment of the population that has long been ignored. Rafael Goldin, who founded the International Museum of Children’s Art with Alla Goldin, his wife, wanted that to change. Children “have the right to their own culture, their own art and history,” he said, and the museum works to preserve that unique culture in many different ways. The heart of the museum is its permanent portrait gallery (which you can explore yourself through the magic of Google, by the way). It also features a variety of rotating exhibits organized around different themes, exploring ideas that are important to kids from many different parts of the world. The museum’s fascinating work put us in mind of another project that explores the culture of children. Photographer Gabriele Galimberti’s series of images, “Toy Stories,” is at the crossroads of anthropology and fine art, showcasing the most prized possessions of kids from all over the world. (Take a few minutes to click through the gallery on Galimberti’s website.) Though the photos rightfully take center stage, the artist’s commentary about play and what it can reveal about culture is worth checking out as well. “The richest children were more possessive,” he said. In “the beginning, they wouldn’t want me to touch their toys, and I would need more time before they would let me play with them.” In poor countries, he said, the shoots were much easier. Though you might think that children with few toys would be possessive, in fact the opposite was true. In the fine arts and for anyone who traffics in stories—which is pretty much all of us—the stories we don’t see or hear are often just as important as the ones we know and love. Childhood is a subject that many artists explore, but we rarely apply the same scrutiny to representations of childhood by the very people who understand it best. Food for thought.